Don’t expect your native planting to look great after the first year. During this time, native seedlings put most of their energy into root development, and will most likely not grow more than a few inches tall. 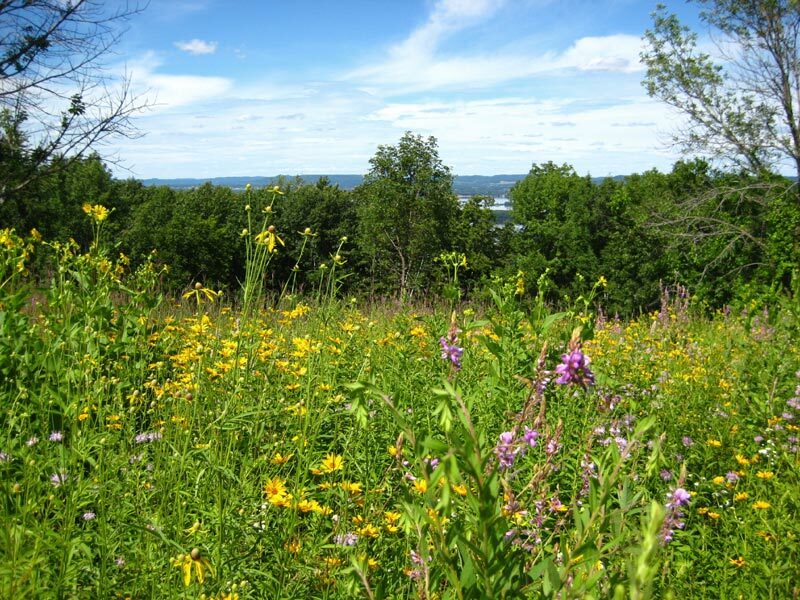 Invasive species will continue to grow quickly and will need to be mowed an average of three times in the first year whenever they reach a height of 18 inches. This will prevent the fast-growing weeds from dropping seed and from shading out the native seedlings. The first mowing (late June – early July) should be to a height of 4 inches, the second mowing (late July – early August) should be to a height of 8 inches, and the final mowing (late August – early September) should be to a height of 12 inches. It’s important to gradually increase the mowing height so the new native seedlings are not harmed. Abstain from hand pulling weeds in the first year. Native seedlings may accidentally be pulled out and new weed seeds can be brought up to the soil surface. 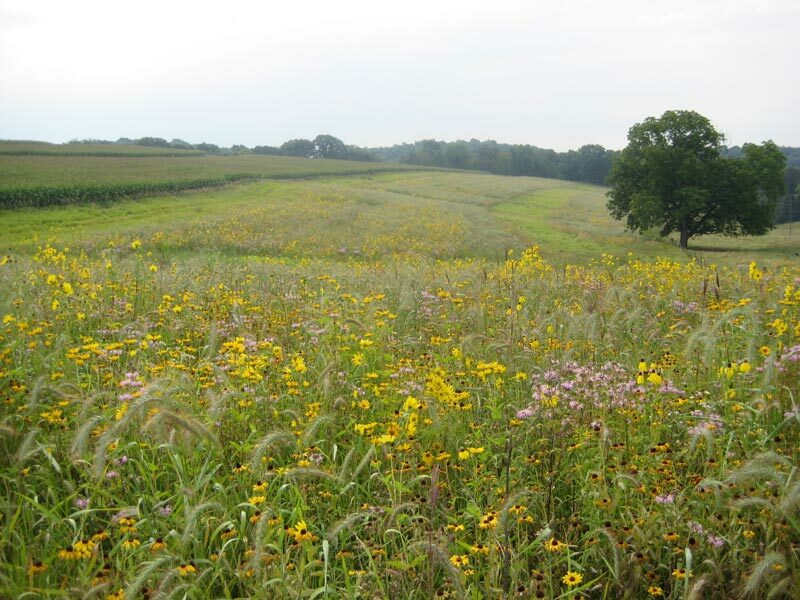 In the second year, the planting should be dominated by cool season native grasses like Canada Wild Rye and early emerging wildflowers like Black-eyed Susan, Wild Bergamot, and Yellow Coneflower. If weeds begin to grow, mow them once to a height of 12 inches early in the spring. Make sure to time your mowing before weeds begin to flower. 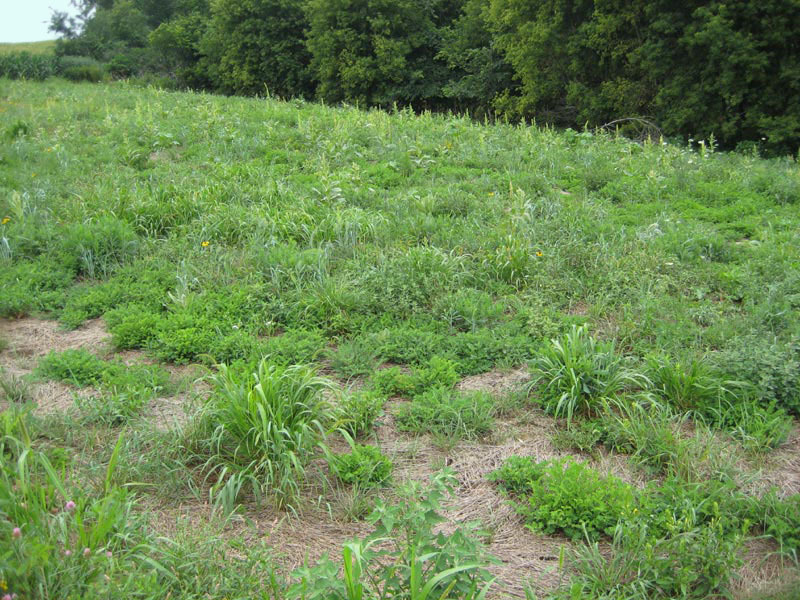 Common weeds like Curly Dock, Burdock, Canada Thistle, Wild Parsnip, or Sweet Clover can also be eliminated by spot spraying with glyphosate or hand pulling. If there is enough fuel to carry a fire, plan on a prescribed burn in March or April of the third year. This will stimulate growth of new wildflowers as well as warm season grasses like Big Bluestem, Indiangrass, Switchgrass, and Sideoats Grama. These species should take the place of most of the early emerging species from the previous years. Always use extreme caution when burning. Prairie fires burn very quickly and can get out of control in no time. As a safety precaution, plan on mowing a 10-15 foot firebreak around the perimeter of your prairie prior to burning, if your site doesn’t already have firebreaks such as roads, rivers, or agricultural fields. If you are not experienced, please don’t try to conduct a prescribed burn on your own. There are several organizations and companies that can provide the personnel and equipment to make sure your burn is done safely. Additional species will continue to appear over the next several years. Some species can take as long as ten years to emerge. Continue to burn every 2 – 3 years. It may be beneficial to implement a burn rotation in which only a section of the prairie is burned at a time. This will provide steady habitat for early nesting birds as well as protection for over-wintering butterflies. 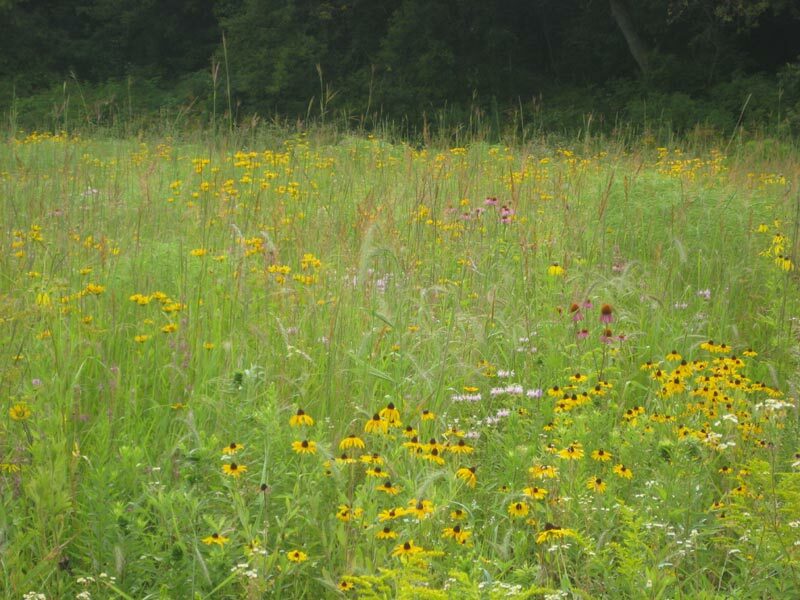 If you wish to add diversity, wildflowers can be inter-seeded in the late fall. Continue to spot spray or hand pull weeds if they are still a problem. 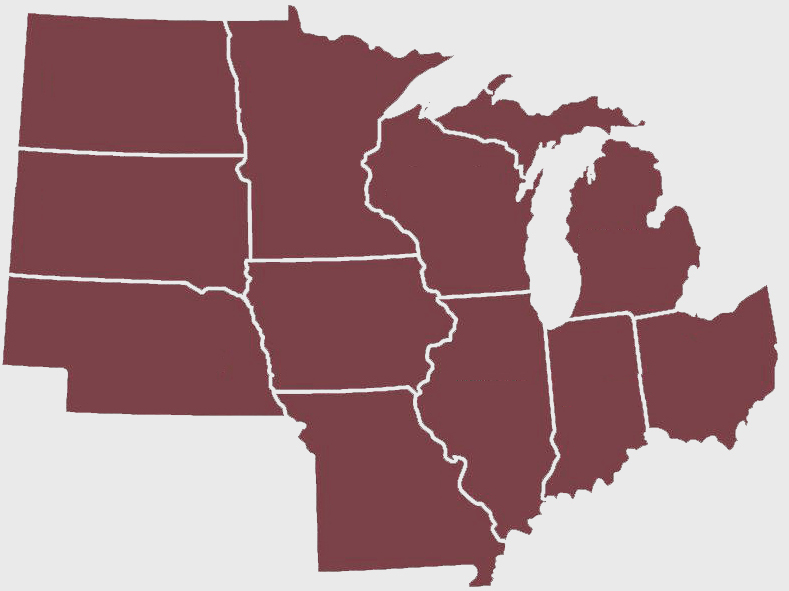 As your prairie continues to mature, the weed population should dissipate.